In 20 years the proportion of adults in the world who can read and write has increased from 75% to 84%. That’s a great improvement in education across the world! 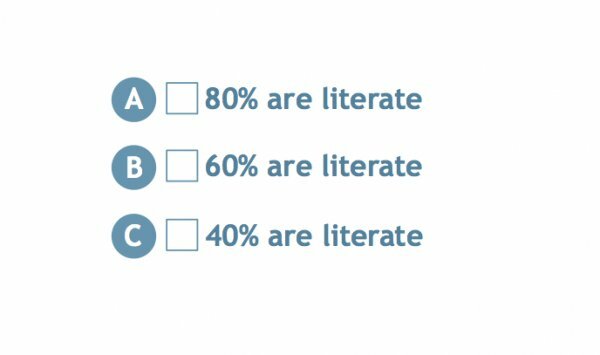 This slideshows shows Test Question 4 from Gapminder Teach: What percent of adults in the world today are literate – can read and write? You can see the question and the alternatives on the second slide; and the correct answer on the third slide. You can also see how the general public responded this question in our public survey. The US, Norway and Sweden present a similar pattern of ignorance in regards to the literacy rate in the world. The question was asked to a representative sample of their population.